It is the end of 2008 and time to take stock of the “progress” on the issue of illegal rooming houses in Bellingham. The refrain from the Simon and Garfunkel song above seems to bring it all together. It has been over a year now, more precisely October 2007, since Council Member Terry Bornemann asked for (See my blog entry on that action here) and the council subsequently voted for a “pilot program” to enforce the Bellingham Municipal Code with respect to illegal rooming houses. The sole city official who seems to have actually done anything on the subject is our Chief of Police, Todd Ramsay, who set up the program of enforcement which now falls under him, or, more precisely, the Neighborhood Compliance Officer. (Click here to read about that) The only problem is that, with the exception of its exposure on my blog, the process is virtually unknown. The Planning Department website, where the program used to lie, much like a wet towel on the locker room floor, has posted nothing to indicate that the Police Department is now the action agency. Perhaps, Tim Stewart will read this and take appropriate action to have his web pages reflect the change. As for the City Council, the subject of illegal rooming houses was last discussed in early August when Council Member Jack Weiss proposed that which I call the Six Legged Stool for dealing with the issue. (Click here to read my blog on that meeting) The task of working on the six topical areas was given to Mark Gardener, the new Legislative Policy Analyst from whom the public has heard nothing, probably because the council has not resurrected the subject in 5 months in spite of my continuing comments on Jack Weiss' proposals in this blog (click here, here, here, here, here and here to read about each one). I wrote Mayor Pike in September (Click here to read my letter) asking him to fulfill his campaign promise to enforce the code and to step out in front of the issue. His disappointing reply to me (click here to read this reply) outlined those actions everyone else was taking on the matter, thus missing my point completely. His preferred method of leading on the subject of illegal rooming houses looks as if to be from the rear, leaving the council as the point so that they can trigger the booby traps. In the words of the inimitable Moe Howard (of Larry, Curly and Moe fame), “I’ll lead the way. Go ahead!” Instead the city leadership whirls around like so many dreidels (I would have said “tops” or “Dervishes” but it is Hanukkah.) on the waterfront, which is going nowhere fast since we are headed with much greater rapidity for a depression (That’s right, you read it here first.). Then nobody will have any money to do anything except for the Terraquarium (read about that here) which might eventually have to serve as alternative affordable lodging (a true housing bubble!). With the virtual silence of the city government, briefly I turned toward the beacon on the Hill at Sehome, Western Washington University, thinking that, perhaps, the new president, Dr. “Call me Bruce” Shepard might meet with me in the spirit of openness which he projected on his arrival. My September letter to him (Click here to read it) outlined several areas tangential to illegal rooming houses and of interest to the university. Seeing him, in fact, proved to be more difficult than expected as I was contacted by an individual in the university’s chain of command about five links down, who had been given the task to respond to me. I managed finally to clamber up the chain, eventually to meet with the Vice President for Student Affairs and Academic Support who graciously spent an hour with me chatting about my letter to Dr. Shepard. I will report on that encounter separately, however, I can characterize the meeting as “a frank exchange of views” which, in diplomatic-speak means we did not agree on much but left open some areas of discussion. When talking about the subject of illegal rooming houses the other day with a Bellingham resident, the matter of predictability arose. When we zone particular areas for a particular purpose, the objective is to separate incompatible uses. One would be shocked to find someone trying to build a gas station at the end of a residential cul-de-sac or for that matter to build a home in the middle of an industrial park. One might also think about the effect of such incompatibilities on the values of the properties. When it comes then to illegal rooming houses, somehow the incompatibility issue is forgotten or brushed off for the sake of convenience or perhaps the dollar – pick which. The result is that your street can be partially rezoned without the slightest warning and without consultation. There is no predictability here. All depends on the whim of a homeowner or a landlord or a property manager who decides that she wants now to rent the place legally, according to the Bellingham Municipal Code or illegally, turning the home into a rooming house. Several months ago I read an article on the subject of the art of selling a home in today’s market. The essence of the piece was that a real estate agent must now be much more familiar with the neighborhood, even the street, on which the sale home is located in order to present the home in its best light. Moreover, the agent must also know about those facts which may cause problems with a sale, such as rentals, especially those which do not conform to code. Were I to have a need to sell my home now, what sight would greet a prospective agent and a potential buyer? Since a good number of people tend to look for homes on weekends and a good number of real estate agents tend to hold open houses on weekends, the picture would be a bit off-putting. A typical Sunday across from my house, the illegal rooming house would be the host of 8-10 automobiles instead of the normal 5 during the week which belong to the 5 students who now rent there. The cars would be parked helter-skelter, according to the relative sobriety of the drivers who parked them the night before. Down the street would be the same sight at another ro oming house with assorted trucks, cars and SUVs. Houses are being sold at a rate greatly reduced from that of the past several years. Your home may be a gem among the others but the condition and use of the homes around you count. Now is the time to take action. Click on the form at the right and complain at this very instant about that illegal rooming house on your street. 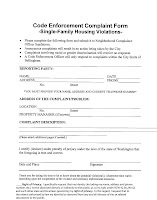 (Send the completed form to Darren Sandstrom, Neighborhood Compliance Officer, Bellingham Police Department, 505 Grand Avenue, Bellingham, WA 98225) It is your neighborhood. Do not let the scofflaws gain control. The Western Front Editorial Board was also busy on the subject of illegal rooming houses. Their editorial entitled Western Housing Crisis Hits the Streets, hit the WWU "newstands" on October 6th. You can read the editorial in its entirety by clicking here. Here is my response to their editorial which I found long on opnion and short on facts. Unfortunately, any crisis in housing of students is one of poor planning and neglect on the part of WWU and the City of Bellingham. WWU has not built a new dormitory in decades while the city has poorly addressed the problem of affordable housing. Students may want to ask the university administration the reason for which so much time, effort and money are being spent to gain a foothold at the waterfront while student housing takes a place down the priority list. Instead, the university is complicit in an atmosphere of neglect which dumps students into a rental market which is not controlled, while asking the residents of our neighborhoods to absorb thousands of students in an unplanned and unregulated infill. The city, for its part, neglects to enforce its own zoning codes. Single family, live-in homeowners are now complaining about this infill and, perversely, are being labeled the “bad guys” because they want the law enforced. As for the legality of the ordinance, the Editorial Board may want to back up its assertions with some facts. Ordinances such as we have in Bellingham have been upheld across the country by various state supreme courts. As early as 1974, the US Supreme Court in Belle Terre vs Boraas has upheld such zoning laws. The majority decision in this case was written by Justice William O. Douglas, champion of individual liberties. On my blog at www.zonemaven.blogspot.com I have provided links to other such court cases and I invite the editorial board to review those. Even Bellingham’s City Attorney has done research on this topic and found that our ordinance is compliant and reported that information to the City Council and the Mayor earlier this year. Nonetheless, the Editorial Board states, “Not to mention, this ordinance is illegal. According to an article in The Western Front from spring 2008, if the law doesn’t discriminate against everyone, it can’t discriminate against anyone.” To be honest, I have no idea what this statement means. Furthermore, I caution the board about citing as a basis for argument an assertion made in its own newspaper by an uninformed writer. The board also states that “Washington State passed RCW 49.60.030 in the summer of 2007 which states people cannot be discriminated due to race, creed, color, national origin and many other factors, according to the Washington State Legislature Web site.” This notion was surfaced by one local attorney who provided his opinion on the matter. Since the Bellingham ordinance contains no mention of race, creed, color, or national origin, I am at a loss to understand its applicability. In any case, only a court can decide the issue. As for the effect of thousands of students on the rental economy, the Editorial Board is correct. There is a distortion of the market that takes place when groups of individuals can pool their money to afford a rental which is out of the reach of a single family. This summer, a family was essentially forced out of a rental on my street when the landlord raised the rent to $2,200 per month, an amount unaffordable by the couple and their son. Inevitably, five students rented the home at $440 each. Finally, the board states, “Students need to do their parts to be respectful of their property and neighbors. Students living in houses need to recognize their neighbors could be permanent Bellingham residents. Give them the respect you want in return; turn the music down, park correctly and pick up after yourself.” This is common sense advice but does not deal with the zoning issue which is one of density and infill. The Western Front published an article on October 6th regarding the placement of advertising for single family home rental whose contents contravene Bellingham’s Municipal Code. You can read the entire article on the Front’s website by clicking here. As it contained numerous inaccuracies, I responded immediately in a comment to that article directly on the website of the Western Front. My readers will remember I spoke to this issue earlier in my blog. You can refresh your memory of those comments by clicking here. I am responding to the article … entitled “Housing ad censored.” Below I have quoted the relevant portions of the article by Mr. Cortes after which I have provided my comments. Unfortunately, Ms. Walker is correct in that the law has not been taken seriously. However, under a mandate from the City Council, enforcement of this portion of the Bellingham Municipal Code has now been placed directly under the Bellingham Police Department. The Neighborhood Compliance Officer is now authorized to respond to complaints of illegal rooming houses. The Planning Office is no longer involved in the process. Exactly. I have written several blog entries on this subject and have also written to the responsible officers of the Viking Union. You can read the blog entries at www.zonemaven.blogspot.com. This summer, the council considered changing the code to allow 4 unrelated persons to rent a single family residence. This motion was withdrawn and the council agreed to consider a range of options to deal with the issue of illegal rooming houses. See my blog entry at: http://zonemaven.blogspot.com/2008/08/council-to-take-comprehensive-action.html for more information on a proposal from Council Member Jack Weiss. Mr. Schuster is correct. It is the city’s ordinance. However, that does not exculpate WWU for its contribution to the problem. This is a substantial misapprehension of the problem by Ms. Kershner and exemplifies the reason for which the city has dealt so poorly with the issue. There are two separate issues. One is zoning and density which is controlled by our codes and does not permit illegal rooming houses. The other issue is that of nuisances which are covered by other laws having to do with parking, underage drinking, noise, littering, public urination, etc. The nuisances can emanate from any dwelling regardless of the number of persons. The limitation on the number of persons prevents single family neighborhoods from becoming high density areas. The VU cannot prevent the problem but it can stop adding to the problem by posting ads whose contents contravene the law. I understand and sympathize with students who cannot afford lodging, however, this is a crisis of affordable housing which has been poorly addressed by the city and which has been ignored by the university in spite of tremendous growth in the student population over the last few decades. Instead the city, which has not enforced its owned codes, has allowed illegal rooming houses to soak up the excess in single family neighborhoods. Now the single family, live-in homeowners are complaining and, perversely, have become the bad guys. Students ought to be protesting the raw deal they get by having to crowd together in living arrangements which are controlled by nobody but the market. The fact is that this individual home rental market is totally uncontrolled, unlicensed and unregulated which places renters at risk with respect to health and safety. There are no inspections of these dwellings where overcrowding and lack of safety devices, emergency exits and suitable heating and plumping cannot be addressed. The point is that the university should be correct in that which it presents to its students. While ads placed outside the university are beyond the control of WWU, the institution’s role should be instructive in promoting the rule of law and the common weal. -Decriminalization of parts of the Bellingham City code to ease enforcement. -Changing, in some manner, the definition of family. -Enhancing enforcement of code violations (upgrade of Litter Control Officer position). -Beginning a dialogue with the new WWU administration under its new president. I have spoken to the first 5 of these issues (of this six-legged stool) in previous blog entries. (You can read those by clicking here, here, here, here and here.) The sixth item relates to the relationship between the city and the university. Many of the problems manifest themselves in that which the City Council and the Mayor call nuisances, e.g. loud parties, litter, drunkenness, illegal parking, etc. I separate the issue of illegal rooming houses, which is a zoning and density problem, from the issue of nuisances which do not necessarily stem from illegal rooming houses, although there are still those who confound the two. That being said, there is reason for the city to talk seriously to the university about off-campus student behavior. I wrote to Dr. Bruce Shepard, President of WWU, in an as yet unanswered letter (click here to read that letter) on 16 September and brought up nuisances as his interview with the Herald implied that he would continue the university’s largely hands-off attitude and asked that the community keep student behavior “in context”, whatever that means. WAC 504-26-200 Jurisdiction of the university standards of conduct for students. So the City Council and the Mayor should talk to WWU, and soon, as part of Jack Weiss’ proposal. They may want to bring a few Bellingham residents along for the discussions to provide "context." NB. Here is a postscript to my blog entry of 29 September (click here to read that entry) regarding WWU and rental advertising. I visited the Viking Union on 4 October to view the housing rental bulletin board. As promised to me by Mr. Schuster, Director of Viking Union Facilities, I found no advertising for single family homes in violation of the Bellingham Municipal Code (BMC). No ads were posted under the headings of “4 and 5 Bedroom Rentals” which is good but leaves one to wonder the reason for which these categories are still there. My understanding was that a warning regarding posting of ads violating the BMC would also be placed on the board, however, I did not find any such notice.